Madison Square Garden became the Phish tank in 2017, the band played seventeen shows at the famous venue when the calendar year came to a close. The group began their annual New Year’s run on Thursday the 28th as the sold out crowd battled frigid temperatures to get into the arena. From the opening “AC/DC Bag” Phish made their musical statement and stuck with it all night; funky grooves that never quit. Mike Gordon was clearly the most valuable player this outing as his bass both anchored and led many of the jams, especially in the excellent first set. The thick funk of “Tube” brought out gyrations from the crowd, “Get Back on the Train” bubbled over with energy before “Your Pet Cat” screeched and bumped delightfully. While the closing “Theme From the Bottom” was a powerful statement (led by Trey Anastasio’s climbing riffs), the highlight of set (and the night) was the dynamic “Wolfman’s Brother” which showcased strong piano work from Page McConnell and passages that veered excitingly close to chaos while maintaining the funky fun. It was the best version of this song we have heard/seen yet. After the brief metallic clanging of “Wilson” echoed out to signal the start of the second set, the band wasted no time dropping right back into the groove, but less successfully this go around. “No Men In No Man’s Land” was the main vehicle as the group spread out behind Anastasio’s pedal work but unfortunately ended up aimless in their exploration, even so the players still managed to keep things fairly light and upbeat. The darker funk came next as “Twist” swirled and while “Everything’s Right” lyrics/chorus are laughable, the dance laden jam that sprang fourth did the job. The second set was wobbly at times but coalesced nicely at its finish as the funk reached its zenith by way of “Also Sprach Zarathustra” before a scenic “Harry Hood” blissfully rolled out over the fans. The odd pairing of the encore (pop groovy “The Wedge” and gorgeous fret working “Slave To The Traffic Light”) prove the band will play just about any tune at any time these days and still sound damn good doing so. This summer Madison Square Garden played host to the Bakers Dozen which clearly invigorated the band; now the world’s most famous arena gets to have the group wrap up a successful year on its stage. 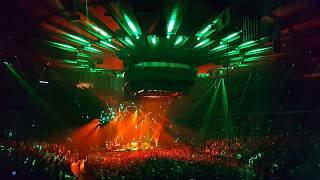 While Thursday didn't hit the highs of the summer shows, it is great to hear and see Phish still playing at a high level 34 years into their career.